Officials in Fort Worth, Texas, said Friday that they were disturbed and outraged by the video of a white police officer arresting a black woman and her two daughters after she called police to report an assault on her son. The now viral video of Wednesday’s incident was posted to Facebook, causing many to accuse the officer of racism, and leading to a protest Thursday night in downtown Fort Worth. At a news conference Friday, Police Chief Joel Fitzgerald acknowledged that the officer’s behavior was rude, but said, “I can’t call [the incident] racism,” the Fort Worth Star-Telegram reports. 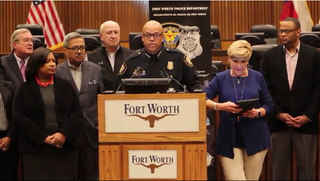 Fort Worth Mayor Betsy Price, who described the video as an “isolated incident,” said, “We do have concerns about some of the actions seen on the video.” She explained that the incident is being fully investigated by police and thanked Fort Worth residents for remaining calm. Texas House Member Nicole Collier said she was outraged by what she saw in the video. As previously reported on The Root, Jacqueline Craig, a 46-year-old black woman, called police after her son reported being choked by a white neighbor. The call was answered by a white, as yet unidentified police officer, and the exchange was captured on video. Craig and her 19-year-old daughter were arrested by the officer, who has since been put on restricted duty pending an investigation. Her 15-year-old daughter was detained. Fitzgerald said Friday that investigating the possible assault of a child should have been the officer’s priority when he arrived on the scene. He added that “99 percent of our officers” would have handled the situation differently. Police interviewed witnesses Friday in the boy’s neighborhood and continued to investigate the assault claim, Fitzgerald said. Police spokesman Marc Povero said Friday that the Facebook video starts about two minutes after the officer arrived, the Star-Telegram reports. Two officers were dispatched to the scene, but one arrived more quickly than the other, and he was the only one on the scene during the incident. Povero said that the officer’s body camera was active from the time he arrived, but Fitzgerald said that footage from that camera will not be released to the public because a juvenile was involved. “As much as the public would like to see every nook and cranny of what we have, it’s sometimes impossible to do so without [dis]respecting the rights of others,” Fitzgerald said. According to Fort Worth police, Craig was arrested for outstanding traffic tickets in addition to resisting arrest. Lee Merritt, the attorney representing the Craig family, has asked that the charges against Craig and her daughters be dropped, and the officer fired. Merritt told the Associated Press that while Craig is not currently considering a federal civil rights lawsuit, Fort Worth police should have to prove that the officer’s actions were not racially motivated, the Star-Telegram reports. Read more at the Fort Worth Star-Telegram.